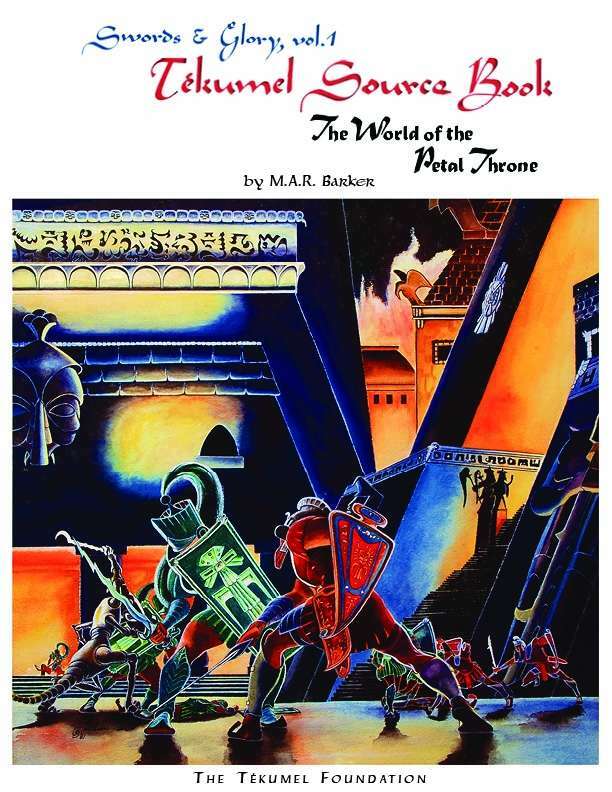 Over the years, from the original Tékumel: Empire of the Petal Throne to the more recent Béthorm: The Plane of Tékumel, there have numerous attempts to create a roleplaying game set on Professor M.A.R. Barker’s world of Tékumel. One such was Swords & Glory, which had something of a fractured publishing history. First published by Games Science in the early 1980s, it was planned that the roleplaying game would consist of three separate books: Swords & Glory, Vol. 1: Tékumel Source Book, Swords & Glory, Vol. 2: Tékumel Player’s Handbook, and Swords & Glory, Vol. 3: GM’s Guide. Whilst the first two volumes were published, the third was not and even then, Swords & Glory, Vol. 1: Tékumel Source Book was subsequently reprinted in three volumes by Different Worlds Publications and Tita’s House of Games. More recently, the Tekumel Foundation has made Swords & Glory, Vol. 1: Tékumel Source Book and Swords & Glory, Vol. 2: Tékumel Player’s Handbook available once again as both PDFs and Print on Demand titles. Swords & Glory, Vol. 1: Tékumel Source Book is a ‘print and scan’ version of the original Games Science edition from 1983. Unfortunately, anyone more used to modern publishing may find this to be a problem. First, the supplement is in an eight-point typeface; second, the use of diacritic marks on its vowels which Tékumel: Empire of the Petal Throne is so very famous for, are clearly marked up by hand; and third, some words are missing. Further, the writing style is scholarly and dense and the contents are organised by section by section, subject by subject in the style of old wargames rules, rather than chapter by chapter. This has two consequences. These issues aside, Swords & Glory, Vol. 1: Tékumel Source Book is not a rulebook, that would come later with Swords & Glory, Vol. 2: Tékumel Player’s Handbook. Instead, it is a systemless sourcebook, a background book, which means that its contents can be with any roleplaying game set on Tékumel. The Game Master would just have to provide the mechanical details as necessary, for otherwise Swords & Glory, Vol. 1: Tékumel Source Book is as detailed an introduction to the setting as you would want. It begins with the planet’s physical nature before taking the reader through its history and to a lesser extent, humanity’s history. This starts some 60,000 years into the future and Tékumel’s discovery and establishment as a vacation world before the Time of Darkness and then on through the disasters and rise and fall of empires which would follow, up until the founding of the Second Imperium, which has now lasted just 2,500 years. Then it goes on to describe the peoples of the Five Empires, the many other intelligent species to be found on the world, clans, gods and religions, how everything is organised from birth to death as well as government, religion, trade, the military, daily life, and society in general, how wars are fought and what arms and armour are used, and so on and so on. It is full of fascinating and interesting facts. For example, how a wife claims redress from a difficult or wayward partner, from simply approaching their Clan elders to legally employing one of the assassins’ clans; what the buttons do on a Tubeway Station and in a Tuebway Car; and how the mighty three-stepped Sákbe roads are a reflection of the Tsolyánu love of displaying personal status. The book is rich in detail, which when pulled form its pages can be used to colour a Tékumel: Empire of the Petal Throne campaign and bring it to life as well as provide possible ideas for adventures and scenarios. So the question is, what is missing from Swords & Glory, Vol. 1: Tékumel Source Book? Well, much like the original Tékumel: Empire of the Petal Throne, there is no list of personal names or lineage names, which given the focus of the supplement on the Tsolyánu Empire, is disappointing. This is further exacerbated by the lack of names, lineage names, and clan names for Livyánu, Mu’ugalavyá, Salarvyyá, and Yán Kór, which is odd given how the sourcebook expands upon the Five Empires essay by essay. Swords & Glory, Vol. 1: Tékumel Source Book was originally published as a boxed set and included in that box was a set of maps. Indeed, the supplement makes reference to those maps, but they are not included here. They are available to purchase online. Physically, Swords & Glory, Vol. 1: Tékumel Source Book is a clean and tidy, if dense facsimile of the original sourcebook from 1983. The book is only lightly illustrated, and although several of the pieces previously appeared in Tékumel: Empire of the Petal Throne, the artwork is excellent. With a fuddy-duddy layout and organisation and a dense content, Swords & Glory, Vol. 1: Tékumel Source Book is both a hard read and a challenge to use. Yet given the paucity of information about Tékumel: Empire of the Petal Throne, the information and background to be found in the pages of the Swords & Glory, Vol. 1: Tékumel Source Book, with its rich detail and flavour, means that it is exactly the supplement a Game Master would want when preparing her Tékumel: Empire of the Petal Throne campaign.